In what very well could be one of the most exciting races every held on radials or any other tires, our clients absolutely dominated the competition at the 2019 Sweet Sixteen. Over time, shock and strut manufacturers have identified the proper valving and design to take full advantage of track surface composition. To further address the need for advancement, Afco Shocks and Menscer Motorsports partnered to develop a unique relationship that has led to new frontiers in shock design. Menscer utilizes a private labeled and designed Afco shock body to perform custom adjustments, dependent on the individual racing application. This collaboration results in highly competitive custom shock package. Afco and Menscer-equipped rides are a staple at radial tire events around the country. Radial and small tire racing has become exceptionally popular over the past few years, with traction and track prep taken to a fine art. This practice of grooming gives way to superb track surfaces that have a tremendous amount of grip, and allows manufacturers the ability to optimize shocks for ideal launch and traction control, leading to outrageous 60-foot times and sub 3-second 1/8-mile passes. In this story, we’ll be taking a look at the installation of a set of Menscer Motorsports shocks to the rear of our Dragzine Project Evil 8.5, and diving into the advantages of installing custom-designed shocks on a race car to provide it with unparalleled performance on the track. Click here to read the full article from Dragzine. It’s no secret that to be successful in racing, one must continually innovate to improve performance and is ultimately what is needed to turn on win lights. Sometimes innovation requires an out-of-the-box thinker to see things from a different perspective, and find new approaches to old problems. Armed with a background in circle-track racing, Mark Menscer has done just that, and his work with the high-powered, small-tire drag cars has them going down the track faster than ever before. There’s no denying that small-tire drag racing has more than it’s share of challenges. With the ability to make as much horsepower as one could want, racers and crew chiefs test endlessly so they can get their cars to apply as much of it as possible to the relatively small 275 or 315mm tire required for various classes. Click here to read the full article from NMCA. The chassis of the Fairlane was originally built by Drummond Race Cars out of Maryland, before Combs purchased the car. Pentagon Race Fab redid the entire front end of the car and removed over 140 pounds of weight, along with making some custom upper and lower control arms that work with the Menscer shocks and AFCO springs. The rear suspension uses all Calvert Racing Caltrac parts, including their amazing leaf springs paired with and a set of Menscer double-adjustable shocks to help keep the car planted and laying down great short times in the 1.14 range. Jason credited shock wizard Mark Menscer, Mickey Thompson’s Tom Kundrick, and Brad Anderson Enterprises’ Jeremy Evrist for helping get the car down the track in record fashion, along with Holley Performance’s Robin Lawrence, Taylor Lastor and Neal Chance Converter’s Marty Chance. As Alepa sat down with Stevens to get the initial plans formed and in stone, they called upon Tim McAmis Race Cars to build a full billet rear end housing for something new and unique to this build. 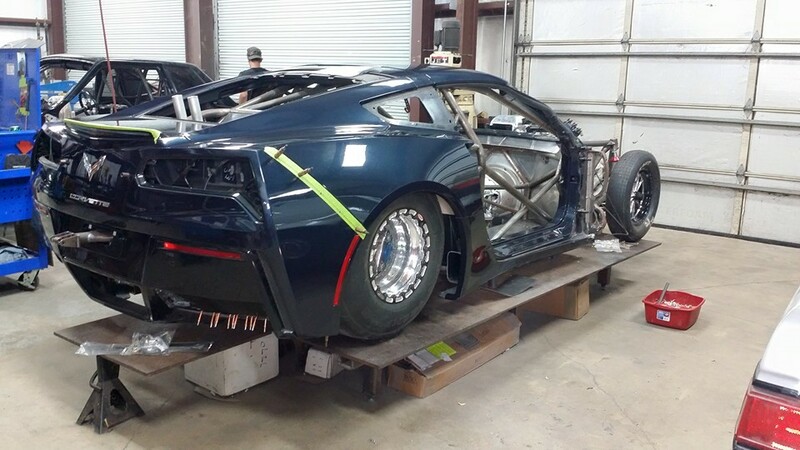 After receiving the housing, Stevens and his talented team of fabricators pushed forward through the tedious process of getting all the chassis bars welded in and placed strategically to ensure stability and strength. Finishing off the rear end of the build is a full billet Tom’s differential supplied by M&M Transmission, a brake system from Mark Williams Enterprises, and custom valved shocks from the mastermind of shock technology, Mark Menscer of Menscer Motorsports.